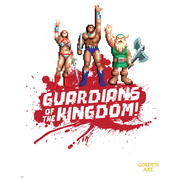 Zavvi Gallery are proud to present this exclusive Golden Axe Fine Art Giclée print, only available in this timed edition sale. Our timed edition sales are only live for 48 hours. Once the time is up they will never be available again. We want to ensure these remain exclusive and rare, so will not reprint.